So there's a young southpaw from Mexico that scouts project to have at minimum, number two starter stuff. But he's not the guy. There's that shortstop with a pedigree from North Carolina that has hit at every level, including the majors in his September call up. It's not him eiher. Jose DeLeon? Brett Holmes? Ross Stripling? Cody Bellinger? Jharel Cotton? Alex Verdugo? All highly touted and I'd hate to lose any of them. But none are the the player I identify either. Barnes isn't expected to be on the big club to start the season, but it isn't because he's not ready. To the contrary. There are some in the organization that believe he should be the starting catcher right now. As his name is tossed around in trade rumors, I can't help but cringe. This is a team leader and the type of player you can build a franchise around in my opinion. Don't believe it? Well look at the numbers. Coming into his own at age 25, Barnes was a middle infielder at Arizona State that the Marlins immediately converted to catcher because of his athleticism and basbeall IQ. A lifetime .300 hitter with the overly impressive .390 OBP over four minor league seasons. That isn't a small sample size. Barnes has 2,190 plate appearances during that time. He works counts, gets on base, all the while with OPS in the mid .800's. He can drive in runs, hit the clutch homer and steal the occasional bag, along with steady defense where scouts rave about his soft hands, strong arm and game calling skills. Add to that the fact that he has thrown out an impressive 30% of runners attempting to steal on him. Barnes is the real deal, but the one thing that isn't shown in his stats is that "leadership" intangible factor. "The one that stood out to me the most was Barnes. I like him. He looked like a real good ballplayer. I think we'll seem him playing real good in the big leagues someday." Carl Crawford after spending July at AAA Oklahoma City during a rehab stint. "He gets to know all his pitchers. He really goes out of his way to find out what type pitcher you are." Barnes, the nephew of former Oakland Athletic Mike Gallego, has that other intangible factor that few have noticed: He's a winner at all levels in the minors. Leading his teams in Greensboro, Jupiter, Jacksonville and Oklahoma City all to winning records and two division championships. This is the type of player that the Dodgers need during the upcoming years when the youngsters develop. A cerebral player. A guy that puts in his work and studies the game. A leader by example. You don't trade someone like this away, especially when AJ Ellis is on the verge of retirement and Yasmani Grandal is a huge question mark after his injury plagued second half. 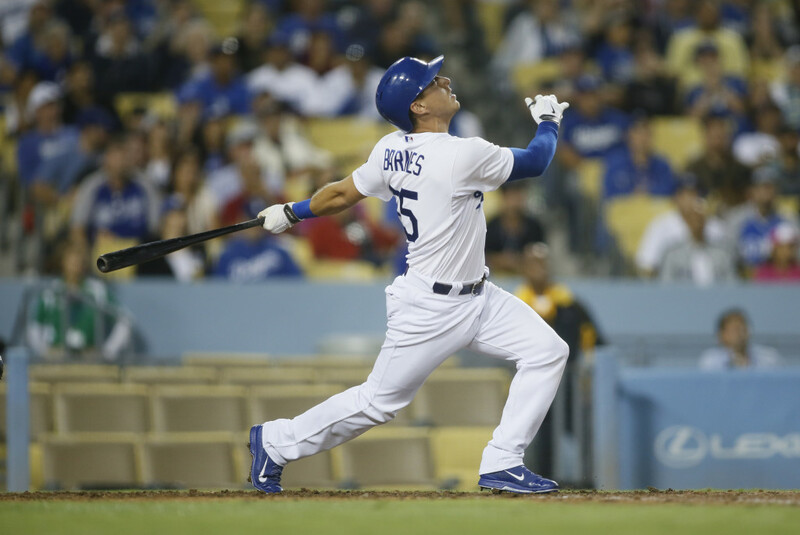 Austin Barnes is the Dodgers catcher of the future, and he shouldn't put his fielder's glove away either, because if the injury bug hits, we just may see him at 2nd or 3rd base if needed. Maybe as soon as 2016. This morning I provide a guest post over at Thinkbluela.com. Take a look at my position regarding the D-Backs signing of Zack Greinke to a record-setting contract.